Some years ago, two popular Irish musicians combined to compile an album entitled ‘There's Life in the Old Dog Yet’. The title came to mind again when this cracking release from a host of reggae’s ‘oldies but goldies’ landed in my mailbox. It serves to confirm that when it comes to reggae, there most certainly is lots of life left in the old troubadours. The 12-track compilation features legendary luminaries like Ken Boothe, The Congos, Lee Perry, Max Romeo, Mykal Rose, Freddie McGregor, the Mighty Diamonds, Pablo Moses, Luciano, Horace Andy and Toots. And to ensure that this treasure trove of talents is utilised to maximum effect, the legendary Sly & Robbie alternate their musical influence on a track-by-track basis with the renowned Roots Radics. With such rhythm specialists at the helm, the all-important musical melodies flourish, allowing the artists’ vocal talents to shine and showcase at their very best. This new release is the brainchild and product of South American percussionist Hernan Sforzini, who used his Afro Studio in Buenos Aires, together with Bob Marley’s Kingston-based Tuff Gong, to assemble a sweet dolly-mixture of musical delights. Sforzine explains his selection as a case of choosing ‘only ones that I love and respect ... and no one turned me down’. 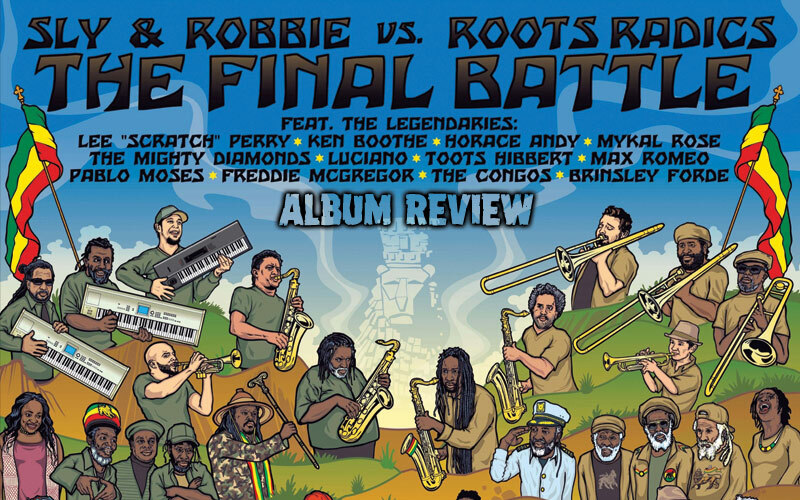 Though the title suggests some style of sound clash, the product is far from a discordant play off between Sly & Robbie and the Roots Radics, as they alternate inputs through the album’s 12 tracks. In fact, it’s a high-quality celebration of much that is good about and from the roots of reggae. Mykal Rose renews acquaintances with his Black Uhuru teammates Sly & Robbie, as they kick off proceedings with Rose’s spine-chilling high pitch This Morning ringing the warning bells, as he copes with the imposition of a curfew and roadblocks. As Rose grapples with this latest worry, Aswad’s Brinsley Forde – with the Roots Radics in tow - fails to lighten the load with a fast-paced Ulterior Motive, warning of those coming at you with deception and in disguise. This puts it up to the Mighty Diamonds – with the aid of some brilliant brass - to change the focus to dwindling love via Change My Mind. Thereafter the popular Freddie McGregor’s familiar sound renders Glory, in a valiant attempt to lift the album’s theme and mood to one of ‘glory to the father’, via some healing and appropriately aspirational sentiments, as he directs the listener to ‘rise and let your love light shine’, as he extols the virtues of the enduring presence of Haile Selassie. Following on the righteous route taken by McGregor, next up comes Horace Andy, who – with the aid of some tantalising percussion and echo effects – urges you to Mind Your Own. This sets the scene for the highly intellectual, insightful and outspoken Pablo Moses, to chide Mr. Negative, who uses propaganda to hide his real intentions. Hence, via a catchy melody and soft silken vocal, Moses directs him to Gwan Run Up Your Mouth. and leave the small people alone. The wonderful and wild wizard that is Lee ‘Scratch’ Perry then enters the fray with Full Moon Plant A Tree. What Perry lacks in vocal range he more than compensates for in trenchant delivery, set to a hot stepping’ musical ensemble that must send even the crankiest cripple to the dance floor. Long live odd octogenarian that is Mr. P.! This is followed by Max Romeo with The Gates Of Hell, who – with the effective assistance of trumpet twirls - takes the opportunity to warn that the evildoers will meet their doom in due course, before Ken Boothe appropriately plays his romantic calling card on Argentina, as he pits the South American country as the focus of his love and affection. The Congos then get stuck in with the aspiration that Things Must Get Better, with Cedric Myton’s falsetto to the fore, before the righteous Luciano picks up the pace as he returns to a well-aired theme, urging us to Make A Change to our way of living and thinking. This leaves the stage to the supreme showman that is Toots – who claims to have invented the work ‘reggae’. Toots’ To You track, with female vocal accompaniment – brings the album to a close and serves to confirm that his fantastic voice is in as good a shape as it was when he won the 1966 Jamaican Independence Festival with the classic Bam Bam. And I nearly forgot to mention that the album also features the silken skills of such ‘need no introduction’ players as saxophonist Dean Fraser, melodica magician Addis Pablo, beat master Bongo Herman and axeman extraordinaire Earl ‘Chinna’ Smith, with members of Steel Pulse, SOJA and (ex) Groundation providing some magical musical context. Putting the package in context with his fine fluency, interesting insights and top tailoring is the great writer and raconteur Roger Steffens – a man who has probably forgotten more than we will ever know about reggae’s roots, rockers and radicals. Steffens aptly describes the compilation as being akin to reggae’s Woodstock – yet again, how right he is. Overall it has to be said that this is a beautiful piece of work. Hopefully the music listening public - via the sound systems, DJs, dancehalls and TV trendsetters – will get the chance to agree.